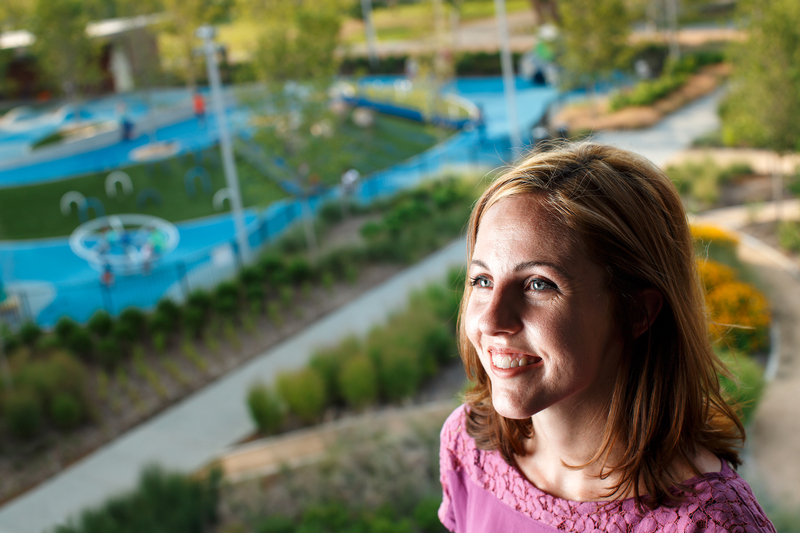 When Jenna Lacey was studying art at UNCG, she never imagined her first job out of college would be managing programs and marketing for Greensboro’s downtown parks, LeBauer and Center City. Yet in some ways, it makes perfect sense. Jenna’s part of the tiny nonprofit staff that makes these parks run, filling them with fun activities on a daily basis with the help of lots of community partners. From Saturday Kids Klub and bubble sports to movie nights and large-scale festivals, Jenna’s got her hands in most everything that happens here. “I like getting lots of ideas and putting them into programs and events and curating activities and social spaces,” Jenna says. This weekend, a project she conceived will come to life: Greensboro’s National Dance Day. It’s an evening of interactive dance performances that celebrate the city’s multi-culturalism. Jenna sees endless possibilities about what Greensboro can do in these parks, if they just take ownership of them.